I am back and ready for summer! I'm back! My readers may have noticed that I have been MIA for the past few months but it has been for a great reason. Jordan and I were busy taking care of the greatest thing to happen to us....our new baby boy. I am now totally into the swing of motherhood and ready to start cooking and blogging again. To start off, I want to share a delicious summer recipe. 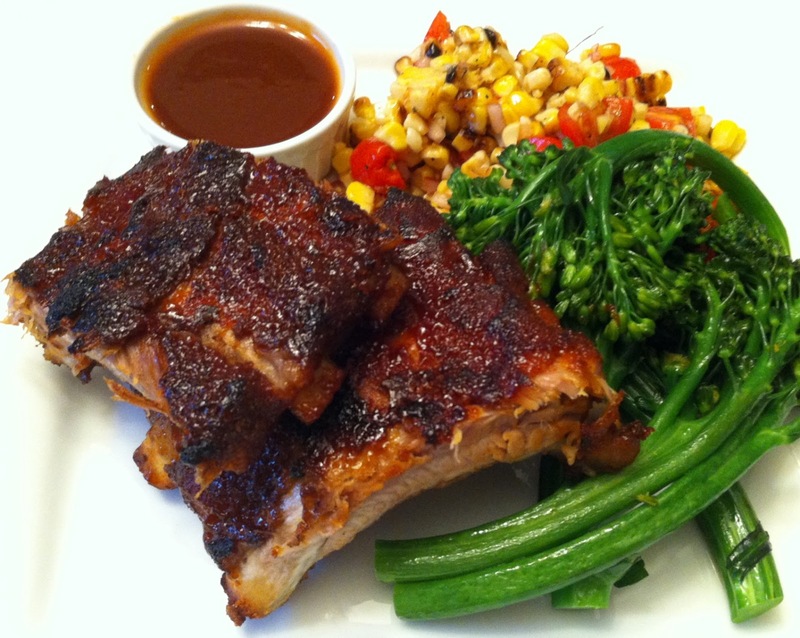 Nothing says summer more than barbecue and nothing says barbecue more than ribs! These ribs are the perfect combination of smoky, spicy and sweet and because they are slow cooked in the oven before hitting the grill they are perfectly, fall off the bone tender. Serve them up with some grilled corn and vegetables and you have a delicious dinner. 2 racks of pork back ribs, about 3 lbs. In a small bowl, combine the paprika, kosher salt, garlic powder, chipotle powder and 2 Tbsp. of the brown sugar. Rub the racks of ribs on both sides liberally with the spice rub, leave to marinate at room temperature for 45 minutes. While the ribs are marinating, prepare the sauce. In a medium bowl, whisk together the barbecue sauce, remaining brown sugar, honey, Dijon, Worcestershire and vinegar. Set aside. Pre-heat the oven to 275 degrees F.
Brush, each side of the racks with some of the prepared sauce. Place each rack on a piece of aluminum foil and wrap tightly making sure no steam can escape. Place the racks onto a baking sheet, seam side up and place in the oven. Bake the ribs for 2 hours until cooked through and tender. Preheat your barbecue to medium-high heat. Remove the ribs from the foil and place onto the preheated grill. Baste with the remaining sauce and cook until caramelized, about 5 minutes a side. Slice and serve with the remaining sauce for dipping.